We are asked a number of questions about our Optimizing Organization Design® approach. For your convenience, we are making these questions and our responses available to you in one place. What is Optimizing Organization Design? What benefits might we achieve by Optimizing Organization Design? Why would I consider hiring Capelle Associates? Wouldn’t it be cheaper to just do it myself? My organization is unique… can you understand it well enough to support us? Do you have experience with our industry or sector? How long does an organization design assessment take? I want to develop the required skills in my organization. Does your approach support this? Won’t this be disruptive to my organization? Should I change my whole organization or can I just change a part of it? Can better organization design help to improve our human resources management? Can better organization design help us achieve our strategy? At Capelle Associates, we define it as the design of an organization including its relationship to its environment (e.g. market, customers, suppliers, etc.) and the inter relationships of its parts (e.g. alignment of positions, accountabilities and authorities, people, deliverables and tasks). 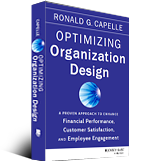 Optimizing Organization Design® is the Capelle Associates’ approach to improving organization performance. We have developed methods, materials and skills to both assess an organization and implement agreed improvements. This approach is based on over 100 large scale projects and 24 research studies that we have completed over the past 25 years. We have comments from over 30 executives on their success in using this approach. Our research and client experience show that optimizing organization design leads to better financial performance, customer satisfaction and employee satisfaction. In addition, optimizing organization design can provide sustainable competitive advantages, significant return on investment, better strategy implementation and better human resources management. We have been specializing in organization design consulting and research for over 25 years. We have senior, experienced consultants to work with you. Most importantly, we have developed an approach that is supported by both research results and client success. That is certainly a possibility. The investment might be less. However, it is also likely that the return on investment would be lower. For example, our approach provides average potential annual cost savings of about $2,500 per position times the number of positions in the review (for a 1,000 person organization, this would be about $2,500,000). As well, our experience, methods, materials and skills can help produce faster, stronger and more sustainable results. Each organization is unique and part of our skill set is to learn about and understand the uniqueness. We have experience with virtually all types of organizations, and have supported clients with operations in most parts of the world. We have completed assessments that have ranged from under 100 employees to over 16,000 employees. We have dealt with many new, complex situations including improving the operations of an organization in over 60 countries and consulting in the nuclear industry. The answer is likely to be yes. Since we specialize in organization design and have been doing so for 25 years, we have worked with most industries or sectors. However, if we haven’t, part of our skill is being able to quickly understand a new industry or sector. We have had many “firsts” in our line of work. Some of these “firsts” include projects for high-tech, nuclear energy and the operations of a client in over 60 countries. All first time … and all successful. This varies depending on the scope of the assessment, but the time from the beginning of the interviews to the delivery of the report generally takes between one to three months. Yes. Our preferred implementation approach is the combination of an internal – external team. We will bring in the required methods, materials and skills. We then work with the internal team to enhance existing systems and methods. We will train and qualify the internal team. The implementation is a cascading, iterative approach that is based on teams. It involves education, doing real work and feedback. This significantly strengthens managerial capability and managerial leadership practices. In these ways, sustainable change is created. First, this approach has been shown by research and client experience to improve employee satisfaction, customer satisfaction and financial performance. It is a win-win-win situation. Second, the employees will currently be experiencing numerous problems with the existing design. Working towards improvement of these issues helps to create motivation and focus. Third, our approach has project management and people change management best practices. It focuses on both the best design and the best way to get there. Changing a whole organization tends to be more effective and cost efficient. However, it is possible to change only part of it. This is sometimes done as a pilot project. If only part of an organization is being changed, the more separate and distinct it is, the more effective this more focused change can be. Yes. Both our research and client experience show this to be the case. Our organization design approach provides the foundation for human resources management. This will include talent management, recruiting, performance management, retention, satisfaction, job evaluation, career progression, succession planning, compensation and managerial leadership training. Yes. When people talk about strategy, they usually mean strategic planning. However, the issues with strategy are usually with implementation rather than planning. Organization design is the foundation for strategy implementation. A sub optimal design will result in a weaker strategy implementation. Our organization design approach will strengthen strategy implementation. Do you have any questions about our approach? Please call 416-236-3044 or fill out our online form to request a discussion and find out more about our Optimizing Organization Design® approach.